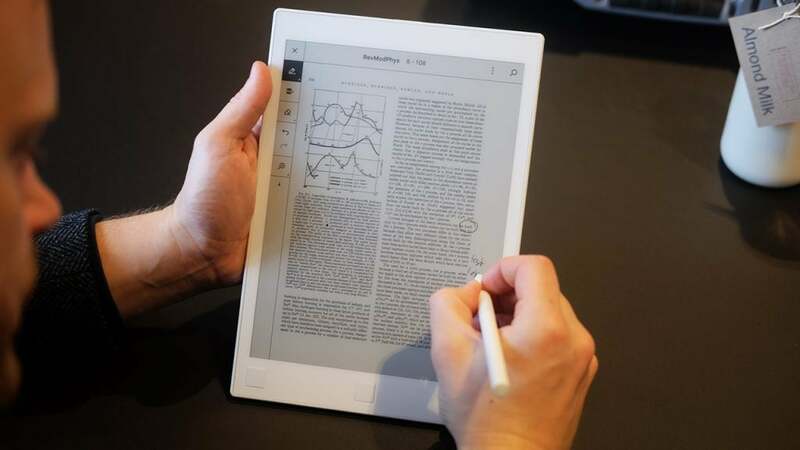 What is the ReMarkable E-ink Tablet? The ReMarkable isn’t a traditional tablet. It borrows aspects of the iPad Pro and Kindle to forge a device that’s brilliant to write on. It’s responsive, easy to use and well-made – not words you’d always associate with first-generation products from a new company – and jotting down notes feels just like writing on paper. But, it lacks certain features that would make it an ideal office companion. As a note-taking tool it could do with integrations with cloud storage platforms like Dropbox. As an artist’s tool it could do with more sketching options. As an ebook reader it could do with a backlight and being a tad smaller. Despite these flaws, I can’t stop using the ReMarkable tablet. Since I started testing it the tablet has become the bit of tech I take to every meeting, something I stopped doing with the iPad Pro and Pencil after a week. The ReMarkable is a solid product that doesn’t look exceptional at first glance. It’s made of thick white plastic with a healthy bezel that makes it easy to grip without covering the 10.3-inch screen. The three buttons on the front flick pages forward and back, while the centre button takes you to the home screen. It’s not all plastic. There’s an aluminium plate on the back that offers a cooler feel and rigidity. Above and below this are two long rubber feet. These are great for keeping the ReMarkable in place on a desk, lap or coffee table. At 350g it is light enough to hold with one hand, but you won’t want to read like that for too long. There’s one other button along the top ridge that puts the ReMarkable to sleep with a short press, or turns it off with a longer one. A single microUSB port sits at the bottom which is used for both charging and data transfer. A cable is included in the box, but a plug isn’t. It might not be the prettiest device to look at, but the ReMarkable team have made all the right choices when it comes to usability. It’s hardy and easy to use. The ReMarkable is powered by a 1GHz ARM A9 processor with 512MB of RAM. That’s a far cry from the multi-core chipsets you’ll seen on high end phones like the Galaxy S8 or iPhone X, but the ReMarkable doesn’t need that much grunt. It runs a very simple Linux-based operating system that doesn’t require much computational or graphical power. However, I would still like it to be quicker. It takes 25 seconds to boot up and it could switch between books faster. I also found that it sometimes slows down and needs a reboot to get back to tip-top shape, but thankfully waking it from sleep is instant. Other than that the specs are just about adequate. There’s 8GB of storage for notes, drawings and ebooks, with 7GB available to the user. That’s ample. I have hundreds of handwritten pages and a dozen ebooks on the tablet and have used less than 10% of that. The monochrome e-ink display is where the magic happens. The display’s 226ppi (pixels per inch) density is a little lower than the Kindle Paperwhite’s 300ppi count, but it’s still great for reading. The only minor annoyance is that it is missing a backlight, so you won’t be able to use the ReMarkable in the dark. You’ll want to use the pen for most things but, the screen is actually touch-enabled so you can hit icons with your thumb when drawing. Palm-rejection is solid and I never accidentally hit an icon or made it unresponsive because my wrist was touching the screen. The ReMarkable’s screen isn’t covered in glass and the company claims it is “virtually unbreakable”. I haven’t tested this by forcing it too much, but I have dropped it on a wooden floor without any problems and I regularly throw it in my bag without a second thought. There’s not a scratch on it so far. If you are worried you can buy the ReMarkable Folio case. This is a tough sleeve that the tablet fits into snuggly. It has hard, fleece-type texture on the outside, which I’m not a fan of, but it also has secure storage for the pen, which I am. At £79, however, I feel it is overpriced, however. You’d be better off buying a sleeve from Amazon for a fraction of the price. iPad Air 2 sleeves are big enough, but won’t be quite as snug. Aside from not smashing there’s another benefit to the lack of glass; the display has real texture. This makes a huge difference to writing. Writing on the ReMarkable tablet is a revelation. Not only does the pen on the textured display feel like paper, it even simulates the same scratching sound you get when writing the good, old-fashioned, way. It really feels like writing in a notebook, and the lack of lag helps keep the illusion up. Touch the pen to the screen and letters spring up almost instantly. There’s just the merest hint of delay, but it isn’t enough to bother me at all. One thing that does is that the tablet forgets my favourite settings for pen thickness sometimes. As a drawing tool, the ReMarkable is a mixed bag. The texture of the screen and low-latency mean simple sketching is a joy, especially when you minimise the toolbox to go full-screen. However, your choice of pencils is limited to three sizes, whether pressure-sensitivity is activated or not. More serious pencil artists would probably rather have the familiar ratings for hardness and darkness – 2H, HB, 4B, etc. You can zoom quickly into a sketch by up to 500%, but zooming back out seems to take an age. Adding layers isn’t fast either. All this adds up to mean, as a basic sketching tool to jot down ideas it’s spot on, but you shouldn’t expect to create finished masterpieces. The pen itself is light and robust. It doesn’t have a battery or need charging but the nibs are replaceable. That’s because the friction of writing on the screen wears them down. I found that I have to replace nibs after two weeks of solid use. It’s not that the pen becomes unusable, more that the writing experience isn’t as smooth as I’d like. 10 nibs, and an extractor, come with the ReMarkable tablet with additional packs of eight available to buy for £12 each. The ReMarkable has a stripped down, simple to use interface. You can access your notes, your ebook library and create new ‘Notebooks’ from the home screen. You can name Notebook by topic – for example I’ve created one for this review – and add as many pages as you like. The home screen also lists your most used notebooks and ebooks. Other than that there’s not much to it. There are a few settings you can tweak, crucially switching sides for left and right-handed users. If you are left-handed then the ReMarkable is even better. There’s no ink to smear so if you like writing by hand rather than typing it’s perfect. It might sound like there’s not much to the ReMarkable, but the ability to create compartmentalised collections is seriously useful. Instead of one paper notebook where all my notes are mixed up, I have every entry clearly defined in it’s own place, where it’s labelled and easy to find. Before this I would burn through paper notebooks and never look at the scribbles again. Now there is order, I do. There are some controls once inside a notebook. There is a pen, pencil and marker to choose from, as well as a highlighter. All (bar the highlighter) have three thicknesses to choose from and three colours – black, grey and white. The pen has three different nibs whereas the pencil just two. As already mentioned, if you’re after a device that you can create digital art on then the ReMarkable is limited, you’ll be better off with a Wacom Mobilestudio Pro if you can afford it, or an iPad Pro or Microsoft Surface Pro 4 . There are also a bunch of templates to choose from. These range from templates for technical drawings to simple line rules or storyboards. Add a template to a page in a notebook and all subsequently created pages bear it. However you can add new ones so a single notebook can have lots of different templates assigned. That’s where the ReMarkable’s features end, and that means there’s a lot missing. Let’s start with the basics. There’s no dictionary for checking words you don’t know. There is a bookmark function, but you can’t use it via the tablet, you have to add them through the Windows, Mac or mobile apps. Why? I don’t know. There’s no store either, and only PDFs and EPUB formats work at the moment. That means you’re hunky-dory if you have a large DRM-free ebook library, but not if your ebooks are saved in any other format or from Amazon’s huge Kindle store. There’s also no PIN or password protection. This is a big deal if you want to use the ReMarkable for sensitive work. Now to the more advanced missing features. Firstly there’s no optical character recognition (OCR). This means you can’t convert your handwriting to text automatically; if you take copious notes in a meeting you will need to type them up. OCR tech isn’t very accurate, though, and you’ll need clearer handwriting than mine for it to work well, even if the ReMarkable packed the feature. Secondly there’s no integration with cloud services like Google Drive, Dropbox or Microsoft Onedrive. This is a major omission for anyone who wants to use the ReMarkable as a serious productivity tool. 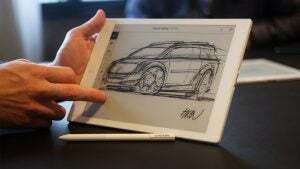 The good news is the ReMarkable team aren’t done with the user-interface and features for the tablet. Liveview, for example, is in beta and allows you to view what you’re drawing almost instantly on a big screen via the app. If this could work with, say, Adobe Photoshop then the ReMarkable could also be used as a graphics tablet. So while there’s a lot missing, there’s still a lot that has been promised to come. One of the boons of an e-ink display is that it doesn’t use much power. A Kindle ebook reader can last for weeks on a single charge. The ReMarkable tablet can’t quite manage that, but its 3000mAh battery can last for several days of regular use – turn Wi-Fi off and you can squeeze even more. I found that I need to recharge it every two to three days when used for 4-5 hours a day. I did find that it sometimes dropped significantly when I wasn’t using it, overnight for example. Manually putting it to sleep by pressing the button seems to fix that, but there are clearly still some optimisations that need to be made to the ReMarkable to keep it lasting longer. Charging via USB cable is reasonably speedy. The ReMarkable charges up to 88% in an hour and 100% in an hour and a half. 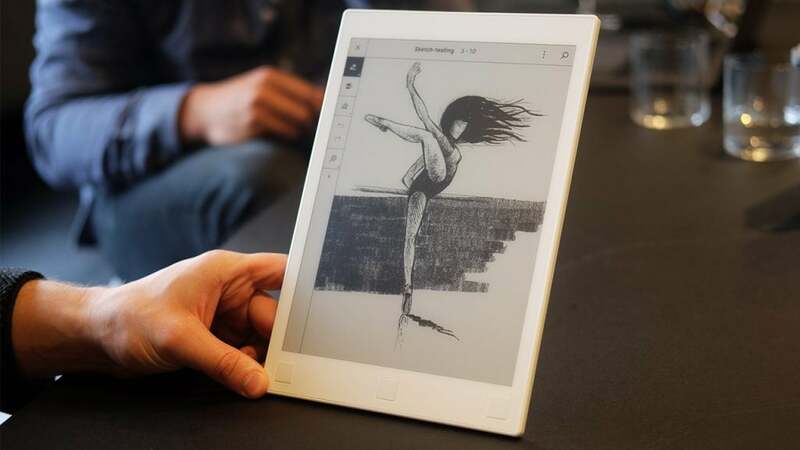 Why Buy the ReMarkable E-ink Tablet? With a price tag of £529 the ReMarkable isn’t an impulse purchase. When you factor in the fact you can buy an iPad Pro and Pencil, which can be used for infinitely more applications, for £189 more it becomes an even harder sell. The ReMarkable tablet is a joy if you like putting pen to paper. It’s the closest thing to writing in a notepad you can get, and I’ve found it to be my go-to device for meetings. It’s far more personal to write notes as opposed to tapping away on a laptop. It’s also easier to demonstrate points, by drawing basic diagrams. Having it in your backpack also means you have an ebook reader with you at all times. It’s not complete by a long shot, there are too many features missing, but when it comes to it’s core reason for existing – natural writing – it’s plain brilliant. There’s also nothing quite like it. Sony produces a similar product, but it’s more expensive and not available in the UK. Yes you can get a tablet computer and stylus, but writing on glass doesn’t feel anything like writing on paper. The only other real alternative is sticking to pen and paper, but where’s the fun in that? The ReMarkable tablet is a niche product, but one that will get you back to writing by hand in a jiffy. It’s not perfect, but it is great. 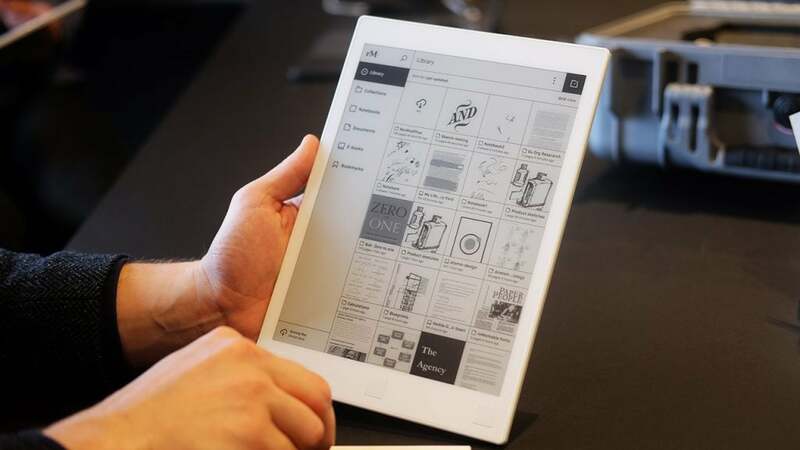 The post ReMarkable E-ink Tablet appeared first on Trusted Reviews.